Laura E. Woodson joined the University of Georgia School of Law in 2014 as an associate director of career development. She is responsible for promoting, advising and preparing students to apply for post-graduate judicial clerkships; outreach to state and federal judges participating in part-time externship programs and the Atlanta Semester in Practice; engaging in employer outreach and the promotion of the school and its graduates in markets in the Southeast and beyond; and providing general career counseling and guidance to students. While she has primary responsibility for clerkships, she works closely with and advises all students in taking ownership of their career paths and improving their job searches and networking skills, without regard to their practice area interests or employer types. Prior to coming to back to her law school alma mater, Woodson practiced bankruptcy and insolvency law in Atlanta for 24 years. She focused primarily on corporate bankruptcy and financial reorganization, representing business debtors, trustees, official bankruptcy committees and creditors over the course of her career. She worked in both the government and private sectors, including several years with the United States Trustee Program (within the Department of Justice) and at large and small firms in the Atlanta area, including Smith, Gambrell & Russell and most recently Scroggins & Williamson. She also worked for approximately 18 months as a legal recruiter. 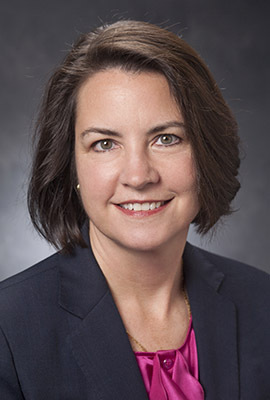 Woodson earned her bachelor’s degree from the University of the South in Sewanee, Tennessee, and her law degree from UGA, where she was a Notes Editor for the Georgia Law Review.